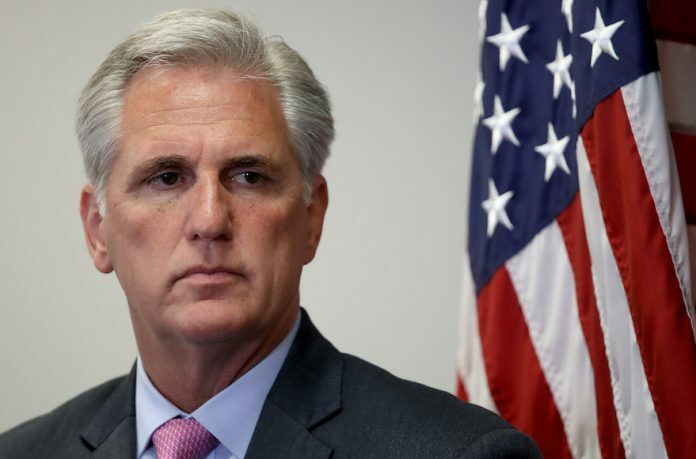 WASHINGTON (JTA) — The Republican leader in the U.S. House of Representatives said he would take action against two Democrats who have sharply criticized Israel if the Democratic majority did not do so. McCarthy said he had recently taken action to isolate Rep. Steve King, R-Iowa, who has long associated with white supremacists. The precipitating event for McCarthy was when King wondered in an interview why terms like “white supremacy” were stigmatized. It’s not clear what statements McCarthy particularly found offensive, but both lawmakers embrace the Boycott, Divestment and Sanctions movement targeting Israel, and both have been accused of tweets that cross the line to antisemitism: Tlaib in January when she appeared to accuse senators of dual loyalty for advancing a bill that would protect states penalizing commerical Israel boycotts; and Omar in 2012 when she said Israel was “hypnotizing” the world. Omar has in recent days apologized multiple times for that tweet. Rep. Nancy Pelosi of California, the House speaker, has not spoken out against the pro-BDS positions or the controversial statements of Tlaib and Omar, although a number of other Democratic leaders have, including Reps. Ted Deutch, D-Fla., the chairman of the House Middle East subcommittee, and Eliot Engel, D-N.Y., the chairman of the Foreign Affairs Committee.